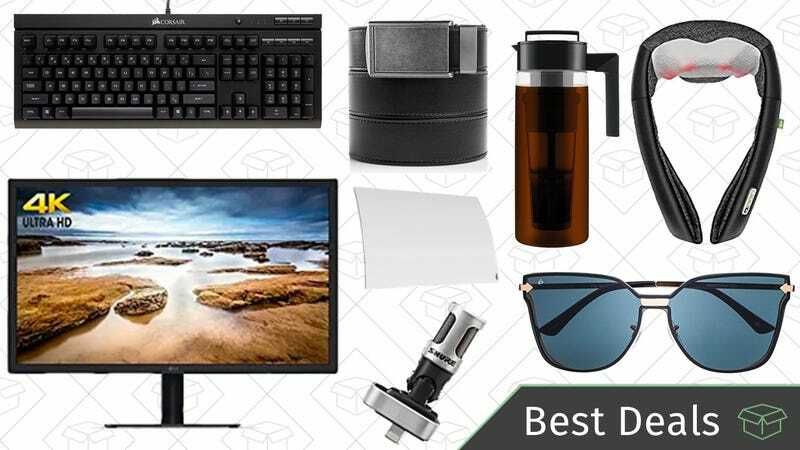 Here’s how to save on ratchet belts, a few electric massagers, an actually affordable 4K monitor, and a whole lot more. As long as your machine has a compatible USB-C Thunderbolt 3 port, this is an absolute steal at $200, even refurbished. At $90 on sale (with code JACKERY6), this isn’t the cheapest USB-C Power Delivery battery pack we’ve seen; not by a long shot. But it has its reasons. 1. Its USB-C port can output and accept 45W or power, considerably higher than the 27-30W you usually see on these types of products. 2. It comes with a 45W USB-C Power Delivery wall charger, which can recharge all 26,800mAh in under 5 hours, and also double as a wall charger for your laptop, Nintendo Switch, or any other USB-C device. Most of these battery packs don’t come with a charger at all. 3. It includes a screen that actually shows you a numerical percentage of its remaining battery life, rather than a vague array of dots. So if you still need a battery pack that can charge your USB-C devices on the road, this one might just be worth the price premium. It’s not a speaker you’d want to rely on for a backyard barbecue, but this Aukey Mini Bluetooth speaker is small enough to throw in a suitcase, and packs a 5W driver and 10 hours of battery life into its shockingly small case. Get it for $19 today with promo code KINJAM31. If you love inky blacks and vibrant colors—and who doesn’t?—this 55" 2017 OLED LG TV is down to $1700 today on MassDrop, or $2400 for 65", both hundreds less than you’d find on Amazon. We’ve seen slightly less expensive LG OLED sets from this year’s lineup, but the E7P includes a built-in sound bar and a premium design that frames the display in glass, rather than plastic or chrome. Because if you’re splurging on an OLED TV anyway, then why not, right? The government should mandate that all TVs come with at least five HDMI ports. I see no downside to this. Until I become president though, this $11 HDMI switcher will have to do. It basically turns one port into two, switches between devices at the press of a button. Just use promo code AUKEYH04 at checkout to get it for $11. USB-C Power Delivery is the future, and you can add it to your car with this $15 charger (with promo code AUKEYCY7). In addition to a regular USB port, you get a 27W USB-C port that can charge a MacBook or Nintendo Switch at nearly full speed. If your laptops run off of USB-C anyway, this is a much sleeker solution than an AC inverter. The 6XX is basically exactly the same as the standard 650, but with a 6' cable rather than the original’s 10', which is actually a better length, in my opinion. The 650s are currently listed for $375 on Amazon, and have never been cheaper than $287, but MassDrop has a limited number units of the 6XX available for $200, while supplies last. The Corsair K66 is one of the most stripped-down models of Corsair’s reader-favorite K-series mechanical keyboards, but it has the one feature that really matters: Genuine Cherry MX Red switches. It’s not backlit, but with its clean design and quiet keys, it’d be ideal for use in an office environment. So buy it for an all-time low $55, then tell your boss you’re expensing it. Leaf-style HDTV antennas are designed to be as unobtrusive as possible, but they’re still basically mud flaps hanging on your wall. Luckily, Mohu created the Curve, which is basically a Mohu Leaf that you stand up on your TV stand or a shelf. Unless you knew what you were looking at, you’d never realize it was a piece of home theater equipment. Your iPhone can take pretty stunning video, but anyone who’s filmed on a windy day or inside an echoey room knows that its microphone leaves a lot to be desired. Luckily, Shure makes a stereo condenser mic that plugs right into your iPhone or iPad’s Lightning port, and even allows you to fine tune settings like gain and directionality with an app. You probably won’t use it every time you shoot an Instagram story, but for special occasions, I could really see the value. For example, I used an iPhone on a tripod to film my wedding ceremony a few years ago, and I wish I’d had this to get clearer audio. For a limited time, promo code KINJAWWK will get you the mic for $115, the best price ever. Just be sure you’re buying from Roberts LP’s Amazon listing. Update: This deal is back in stock, if you missed it earlier in the month. Anker’s PowerPort line of USB chargers has long been a reader favorite, and today, you can get a model with five ports (two of which are Quick Charge 3.0 ports) for $27. That’s a port for your phone, your tablet, your smart watch, your Bluetooth headphones, and your e-reader. Just use promo code ANKERQC3 at checkout to save. Once you have a Qi-compatible phone, you know that you can never have enough charging pads scattered around your house. This one from iClever can charge compatible Android phones at 10W, or iPhones at the standard 5W, and it’s just $10 today with promo code HAPPY099. Update: Promo code VLVWCS5Z is working now, if you had trouble this morning. A monitor shelf can raise your display to a more ergonomic height, and give you back some valuable desk space in the process. This one’s nothing fancy, but it’ll get the job done for just $12 with promo code VLVWCS5Z. Sub-$100 sound bars generally don’t have subwoofers, let alone two of them. But that’s exactly what you get with this refurbished Yamaha, which would be a great upgrade if you’re using the built-in speakers on any of your TVs. At $90, it’s never been cheaper. FREE Google Home Mini With $150+ eBay Purchase | eBay | Promo code PFREEMINI | Excludes gift cards, paper money, and real estate. This non-coffee drinker bought one of these a couple years ago, and I loved the thing (though admittedly, I have since upgraded to the OXO alternative). All you have to do is fill the basket with ground coffee, fill the container with water, and let it steep overnight in the fridge. The resulting coffee concentrate needs to be watered down, so one batch should last you several days. What Casper did for mattresses, Burrow has done for couches. The online sofa store lets you pick your your couch’s size, its fabric, its leg color, and even the height of its arms, add a chaise sectional or ottoman if you want, and get it shipped to your front door for free. If you don’t like it, you even get 30 days to return it. Shane tried out Burrow’s offerings over on Gear, and came away impressed. And as someone who went couch shopping about a year ago, I really wish I’d known about it, as traditional furniture shopping is only one or two circles of hell away from car haggling. So if you want to upgrade that couch you bought off Craigslist in college and get yourself something nice, our exclusive promo code KD100 will take $100 off any $1,000+ Burrow order, which is the best deal you’ll find on the web. It may not be officially summer (it’s not even Memorial Day yet) but Urban Outfitters is ready to give you the best summer ever. Right now, take up to 40% off a ton of pool floats, mugs, glasses, planters, and more to get you ready for the seasons of being outdoors. ‘Tis the season for home improvement projects, and these discounted Porter Cable power tools can handle pretty much any job you throw at them. Today only, score an all-time low price on a 20V hammer drill, a very good deal on an oscillating multitool, and the best price ever on a, uh, Bluetooth speaker and radio? Spruce up your outdoor space with this sale on Hampton Bay patio furniture from Home Depot. They have big 6-person dining tables, umbrellas, chaise lounge chairs, and more, all up to 40% off. But the sale will only last until the end of the day or until the products sell out, so wait too long. Gift your dog a travel-friendly Petmate dog kennel for 30% less today. It has a squeeze latch to deter any escape artists and plenty of windows for ventilation. The small, medium, and large sizes are all down to the best prices we’ve seen in almost a year. 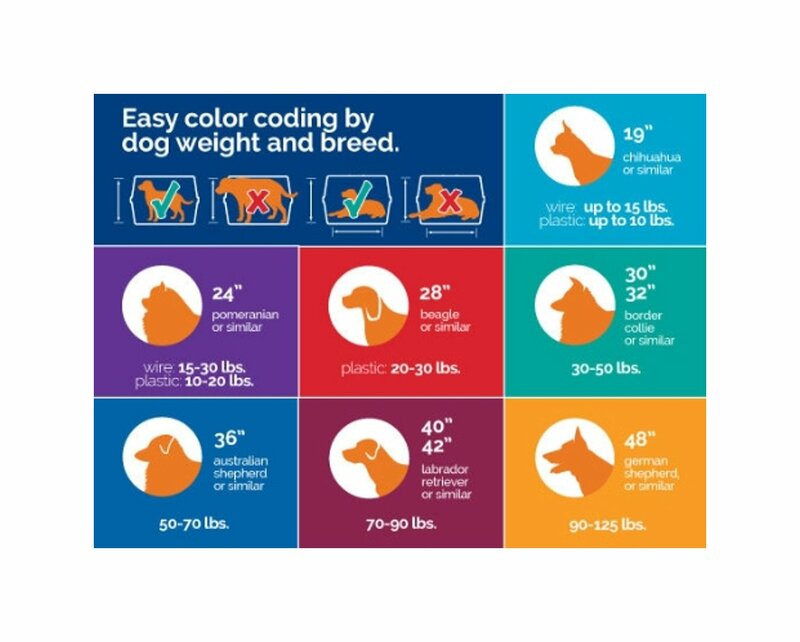 Just consult the weight recommendations or check out this chart if you’re unsure on which size to buy. FWIW - I’ve been looking at hoses for the past week, and the Tacklife hose is a really great deal. I bought a similar (yet without a brass cutoff) hose at Home Depot for $40 this past weekend. I bought the Tacklife and am returning the HD one. Get it for just $18 today with promo code 6YP9N8P3. Host an outdoor dinner party for your friends, not the mosquitoes, with these discounted Tiki Brand torches. Amazon’s discounted a whole bunch of the traditional stick-in-the-ground torches, more decorative glass models, plus some smaller tabletop candles. This sale will only last through the end of the day or until they sell out, so get what you need before this deals runs out of fuel. This $21 drinking fountain filters water, not once, not twice, but three times to produce water worthy of being in your cat’s presence. Today’s price is the best we’ve seen in 6 months and there’s a chance it *might* make him/her love you. If you haven’t made your summer vacation plans yet, may I suggest St. Kitts? The brand new Park Hyatt St. Kitts is running a pretty incredible promotion right now, as first noticed by The Points Guy, that offers your fourth night free, plus a $300 resort credit per person, which you can spend on spa treatments, meals, and more during your stay. All you have to do is search for a 4+ night stay on the hotel’s site, and be sure you’re selecting a room from the “4th Night Free With Credit” tab. This tab averages out the price of the four nights, including the free one, so if you see a room for $300 (which seems to be the going rate for a standard room), you’ll pay $1,200 plus tax for a four night stay, not $900. That same room would normally sell for $400 per night to non-Hyatt rewards members, but it seems like members get cheaper rates in the range of $340. That’s a pretty great deal on its face for one of Hyatt’s nicest properties, but the $300 resort credit is what really makes this deal incredible. That credit is per person, not per room, so if you brought three other people with you, you’d get nearly as much value in resort credit as what you spent on the room. Just be sure you’re entering the correct number of guests when you search for availability. As always, we recommend paying for your stay with a travel card like the Chase Sapphire Preferred or Reserve, or the Amex Platinum, which will net you a ton of valuable points, plus extra benefits like trip delay insurance and airport lounge access on your way to the island. If you have any trips on the horizon, you can save $40 off your next 2+ night, $400+ hotel stay through Expedia with promo code KINJADEALS40. The asterisk here is that most major hotel chains (except Hyatts, notably) are excluded. But most cities have at least a couple of Hyatt properties, or you could use this as an excuse to try a cool boutique hotel that you might have otherwise missed. There are no blackout dates, but you will have to prepay for the room (you can cancel for a full refund), and you’ll have to complete your trip prior to the end of September. Safe travels! You know those “Magic Erasers” that can wipe stains off seemingly any surface? They’re really just melamine sponges with a marketing budget, and you can get 20 off-brand equivalents for just $9 on Amazon. I used these after moving into a new apartment last year, and they made quick work of all of the scuffs I made on the walls. OxyLED’s ultra-popular T-02 motion-sensing lights now have warm LED variants, and you can pick one up for just $13 today with code M86GPVUZ. The T-02 runs off a rechargeable battery, so you can stick this light anywhere you want, and it’ll turn itself on when it’s dark enough and it detects movement. If you have any furniture you’ve been anxious to replace, you can save up to 70% off home goods from this huge Wayfair Summer Sale. Peruse their bed and bath discounts, home decor selection, outdoor gear, and more, and you’re sure to find at least a couple things you like. Just remember, shipping is free on any orders over $49. Anker’s LC90 flashlight puts out an eye-watering 900 lumens, is IP65 water resistant, and can recharge over USB. So for $21, why have you not already ordered a bunch of them? The warm weather is finally starting to become the norm, and that means breaking out of your boots and into something a bit more lightweight. Sperry is here to help you out with select $50 boat shoes when you use the code SALEBOAT at checkout. Yeah, these inflatable lounging blobs look ridiculous, but they’re very comfortable, they work in the pool, and they basically inflate themselves - no pump or lung strength required. Try one out for just $22 with promo code 8FHSY6QG. Amazon’s top-selling hammock, the MalloMe camping hammock comes with ropes to tie it up, fits two adults, and holds up to 1,000 pounds, which seems like overkill, but can’t hurt. Today’s price is down a couple bucks from the usual $27 - $30, just in time for summer. Unfortunately not every color is discounted, so for the best deals, pick between the purple, green, or black hammocks. Privé Revaux turned the sunglass industry on its head last year with a wide variety of attractive frames for just $30 each, but you can get them for even less today with 25% promo code PR25KINJ. If you’ve never tried a Kiehl’s product, you are sincerely missing out on something really amazing. Everything I’ve ever tried from them has stayed in my skincare rotation and I always restock. Right now during their Friends & Family Sale, take 20% off your entire purchase with the code FRIENDS and you can restock (or try something out) for less. We’ve featured several Mynt massaging products here over the past year, and now, they’re running an Amazon Gold Box deal for the first time ever. There are three products included in the sale, all priced at new all-time lows. The most popular of the bunch is almost surely the cordless massage pillow, now available for just $30. Its four rotating nodes can massage any part of your body in pretty much any location, and it runs for two hours on a charge. For a more intense experience for your shoulders, consider this cordless model for $44. It includes arm straps to help you apply pressure, and eight massage nodes with multiple modes. And finally, your feet deserve a little TLC too, and this high-end foot massager can do both shiatsu and air pressure massages, and seems like the ideal place for your feet after you kick your shoes off for the day. Amazon’s back at it again with the sample boxes, this time offering up eight or more protein bars, vitamins, snacks, and other nutrition & wellness samples. You’ll pay $7 to get the box, but you’ll also get $7 to spend on a full-sized version of your favorite sample, so it’s a wash.
You can keep pretty much everything you need within arms’ reach with this Coleman camping chair. It comes complete with a small cushioned cooler (capacity for up to 4 cans and some ice) and a big mesh pocket for your phone, magazine, book, whatever else you might need. Very rarely below $20, you can pick up the black chair for only $17, while it lasts. I realize it’s May, but this illustrated Die Hard Christmas book is a great read all year long, and at $10, it’s never been cheaper. Even if it lives in your Christmas decoration storage box for the next six months, it could still be worth grabbing with this sale. Update: This just dropped to $24. If you preordered it yesterday at $34, you’ll automatically get the best price, so you don’t need to do anything. Breath of the Wild is one of the greatest games ever made, so we’ll forgive Nintendo for spiking the football with a ~400 page hardcover compendium full of design artwork, commentary about the game’s development, and a history of the Breath of the Wild’s take on Hyrule. The book doesn’t come out until November, but you can preorder it today for $34, or $6 off. Plus, if it gets any cheaper between now and release day, you’ll automatically get the best price. Most of Humble’s ebook bundles focus on self-help and educational titles, but the Super Nebula Author Showcase bundle features 42 (!!) works of speculative fiction that you can read on the device of your choice. Featured authors include the likes of Octavia Butler, James Morrow, and Tim Powers, and you can download all of the books for as little as $20, or pledge just $1 to unlock this first tier of 10. Update: This sale ends at the end of this week, so get downloading! You can see all of the deals here, but a few of our favorites are below. Be sure to drop your own recommendations in the comments too. In the year 2018, the Xbox One controller still doesn’t have a built-in rechargeable battery. But if you don’t want to deal with a bunch of stray AAs, AmazonBasics will sell you two rechargeable battery packs that fit in the controllers’ battery compartments, plus a slick charger that plugs into the front of the Xbox One S to recharge them. It’s just $13 today, an all-time low, and about $7 less than usual. Hyrule Warriors Definitive Edition | $48 | Amazon | Prime members only. Discount at checkout. You’re forgiven for missing Hyrule Warriors on the Wii U or 3DS, but now that it’s coming out on the Switch, it’s worth picking up for any brawler or Zelda fans out there, even if it’s not really a Zelda game. The definitive edition includes 29 playable characters and all of the game’s original DLC, and you have two more days to preorder it and save 20% with your Amazon Prime membership.